Single room on the ground floor with large window.Ensuite shower, sink and wc. 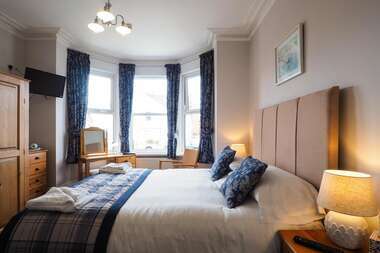 Double room on the second floor (please note two flights of stairs) with kingsize bed.Window seat looking over seafront to the sea.Ensuite bath with hand held shower suitable for hair washing only.Some sloping ceilings. Bright and sunny ground floor double room with large bay window.Kingsize bed.Ensuite shower, sink and wc.Views over courtyard, car park and houses behind property. 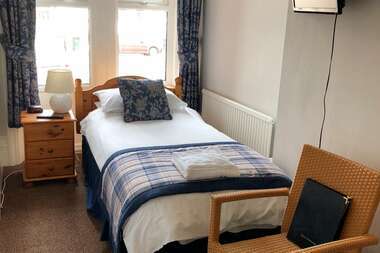 Double room on the first floor with en suite shower.Kingsize bed.Two large windows looking over houses behind to South Downs in the distance. 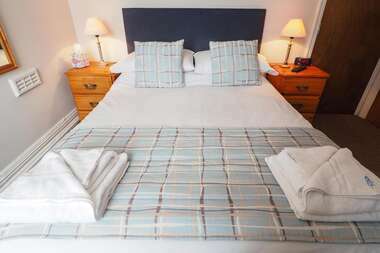 Double room on the first floor with ensuite shower.Kingsize bed.Two large windows overlooking houses behind to South Downs in the distance. 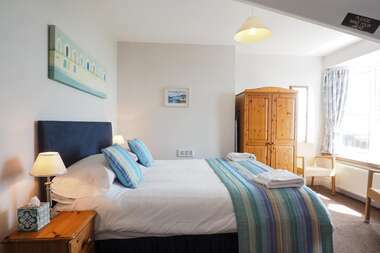 Double room on the first floor with sea views and private balcony with table and chairs.Large bay window.Seating area.Kingsize bed.En-suite shower, wash basin and wc. 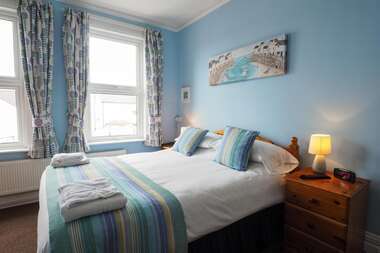 Double room on the first floor with sea views and private balcony.Large bay window.Seating area.Kingsize bed.En-suite shower, wash basin and wc.Please note room is for adults only. 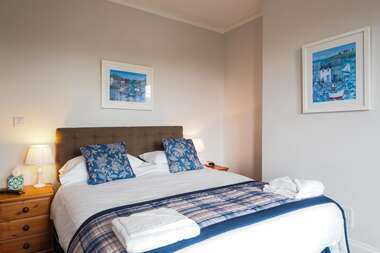 Budget double room on the second floor (note two flights of stairs).Ensuite bath with shower to wash hair only.Window overlooking houses behind with the South Downs in the distance.Please note this room has sloping ceilings as it is in the eaves of the roof and has restricted head height in some areas.